Japan announced Tuesday it will buy stealth fighters, drones and submarines as part of a splurge on military hardware that will beef up defence of far-flung islands amid a simmering territorial row with China. The cabinet of hawkish Prime Minister Shinzo Abe agreed to spend 24.7 trillion yen ($240 billion) between 2014 and 2019 in a strategic shift towards the south and west of the country -- a five percent boost to the military budget over five years. 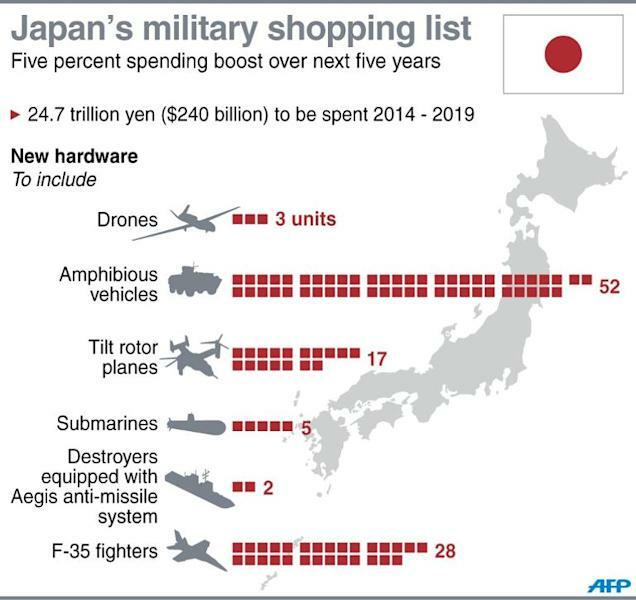 The shopping list is part of efforts by Abe to normalise the military in Japan, which has been officially pacifist since defeat in World War II. Its well-equipped and highly professional services are limited to a narrowly defined self-defensive role. It comes with the establishment of a US-style National Security Council that is expected to concentrate greater power in the hands of a smaller number of senior politicians and bureaucrats. Fears are growing in Japan over the rising power of China, with the two countries embroiled in a dispute over the sovereignty of a group of islands in the East China Sea, and the perennial menace posed by an unpredictable North Korea. New guidelines approved by the cabinet on Tuesday said Tokyo will introduce a "dynamic joint defence force", intended to help air, land and sea forces work together more effectively. Abe said the shift would allow Japan's military to better shoulder its responsibilities on the global stage, through what he has promoted as "proactive pacifism". "We hope to make further contributions to the peace and stability of the international community through proactive pacifism," he said. "This shows with transparency our country's diplomatic and defence policies." Spending will be raised to 24.7 trillion yen over five years from April 2014, up from the present 23.5 trillion yen over the five years to March 2014, but the figure could be trimmed by up to 700 billion yen if the defence ministry can find savings and efficiencies. New hardware will include three drones, 52 amphibious vehicles, 17 Osprey hybrid choppers and five submarines -- all designed to boost maritime surveillance and bolster defence of islands. The spending will also encompass two destroyers equipped with the Aegis anti-missile system and 28 new F-35 fighter jets, a stealth plane far superior to the F-15s that Japan currently has in service. Analysts noted that much of this kit will replace obsolete equipment, but the shift in military priorities is evident. "The guidelines underscore a clear shift of Japan's major defence focus to the protection of its islands in the East China Sea," said Hideshi Takesada, an expert on regional security at Takushoku University in Tokyo. During the Cold War, Japan's military was largely static, with the majority of resources in the north and east to guard against any invasion by Russia. But changing dynamics and in particular the rise of China -- where double-digit rises in defence spending are the annual norm -- mean that Japan's armed forces need to be located further south and to be able to deploy to the country's many far-flung islands. 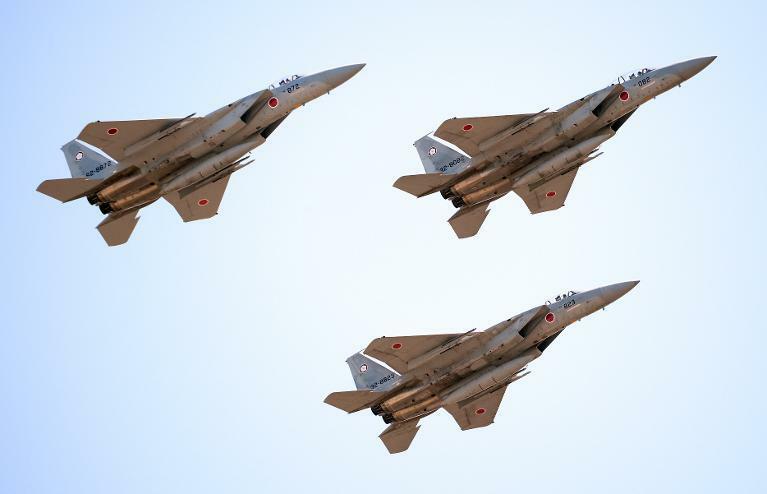 "The guidelines show Japan's readiness for practical defence if China's bluff turns to be real military action," Takesada said. Regional tensions were ratcheted up last month when China abruptly declared a new Air Defence Identification Zone over the East China Sea, including over disputed Tokyo-controlled islands called Senkaku in Japanese and Diaoyu in Chinese. Abe on Saturday denounced the declaration and demanded Beijing retract it immediately and unconditionally, after a summit with Southeast Asian leaders where a joint statement called for freedom of travel on the seas and in the air. 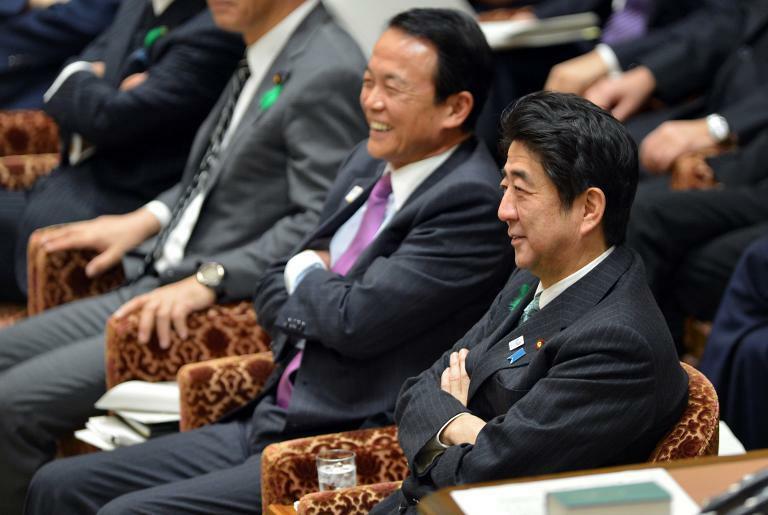 Beijing issued a sharp rebuke, singling out Abe for "slanderous remarks". The guidelines also call for Japan to boost its missile defence system to counter "a grave and imminent threat" from North Korea. Pyongyang conducted its third nuclear test in February, following a rocket test in December 2012. The recent purging and execution of the uncle of leader Kim Jong-Un further set nerves on edge, with analysts warning the isolated nation had become even more unpredictable as it marks the second anniversary of the death of Kim's father.